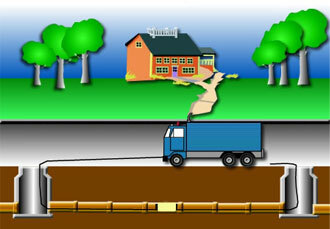 CLEAN: Remove all foreign material and debris from host pipe using a hydraulic high velocity jet spray. INSPECT: With the assistance of a pan and tilt 360 degree optical lens camera that is capable of viewing the complete circumference of the pipe, accurately determine and document the location of the damaged pipe. Stop as necessary to document additional structural problems, location of laterals and the general condition of the pipe. FLOW CONTROL: With the use of a flow-through bladder, bypass pumping is normally unnecessary. MIX: The two-component 100% solids ambient-cured epoxy is supplied in two parts: simply mix Part B into Part A. Once mixing is complete, impregnate the liner with sufficient resin to compensate for migration of the resin into the defects in the pipe. This migration of the resin will effectively prevent the intrusion of water and soil while retaining its integrity. The system is formulated to provide a thirty minute window of time in which the liner must be installed. However, if necessary, the timing can be extended. The system is formulated to provide a thirty minute window time in which liner must be installed). This window can be extended. The liner is fastened to the carrier. INSTALL: Use the pan & tilt 360 degree optical lens camera to position the bladder in the area to be repaired and pressurize the bladder. FINISH: The bladder is deflated and withdrawn from the host pipe, yielding a high strength, chemical and water resistant, cured-in-place liner providing a smooth transition from the host pipe. The complete repair will provide the owner with long- lasting service with a minimum level of inconvenience to the traffic and public.